Believe it or not, the traditional Happy Birthday card layouts and ideas are hard for me to come up with (LOL). But I hope you like these! These cards were also part of the Birthday Card Kit class I had held. Stamp and out 3 different presents stamped in 3 different inks. With the yellow present, I colored the dots with the Barely Banana Stampin' Write Marker. Stamp Happy Birthday (greeting) in Blue Bayou. Layer pieces and then adhere to card front on a slant. Add presents over the corner of greeting with Dimensionals. Ink the wheel with Purely Pomegranate ink pad. Roll across the Rose Red cardstock. Wrap white grosgain ribbon around Rose Red cardstock and adhere to card front. Stamp the candle in Purely Pomegranate ink (on Whisper White cardstock) and color flame with Barely Banana marker. Stamp the cupcake top in Barely Banana and cut out. Stamp the cupcake bottom in Blue Bayou and cut out. Adhere to Whisper White cardstock with Dimensionals. Layer pieces and adhere to card front. 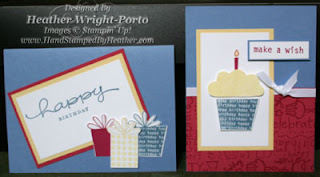 Lastly, stamp your greeting (Make a Wish) in Blue Bayout, layer, and adhere to card front with Dimensionals.